I know this sounds like a cliche but I believe this to be true. 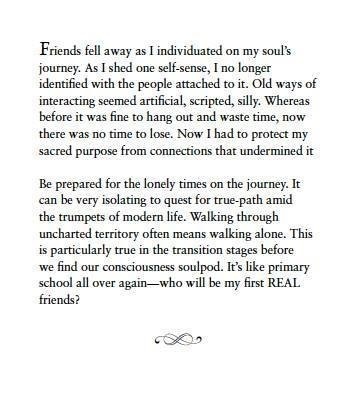 I started down the spiritual awakening path a few years ago. This is the first time, I was introduced to the concept of healing ourself, examining our wounds, facing our fears, and most important, looking within ourself to find answers, and forgiving ourself. This is a practice this is ongoing. We live in a world that doesn’t focus on self awareness and authenticity instead society assigns blame. Everyone is a victim. I think we must step away from that mentality and move towards embracing our true self. This is what I refer to as becoming comfortable in your skin. Not being afraid to express yourself authentically. Sunday blessings for healing and wisdom. Our path, our story, our voice is ours alone. We all need love and support to keep us grounded and motivated but we mustn’t forget that in the end, it is us who has to write the final chapter and be accountable to the choices we make. So don’t settle and become a footnote in someone else’s story! I’m feeling grateful and connected tonight. I’m so blessed to have so many amazing women in my life right now. We meet every Monday and sit in our empowerment circle and hold space for each other as we share our life stories. Tonight as I was driving back, I had a light bulb moment of deep reflection. The message that I received from my inner wise woman was about my current path towards healing my wounds from the past and the future transformation and awakening I’m experiencing. The message was simple. We are traveling on this road where we experience many intersections, sometimes we turn away from our path and that is why certain things happen in our life as challenges and obstacles, temporary setbacks to help us get back on the right path. So the lesson of the last few months has been for me to find my way back. I was just lost for a little while, but now I’m back and ready to keep on traveling through. Tonight I’m sharing an excerpt from an article that I can completely relate with. As a healer, I’ve learnt that one can’t fix the broken and wounded part of ourself by constantly giving ourself to others. Not only will you drain your energy and take on everyone else’s problems, those who you help might start to resent you or get confused when you try to stop the care take triangle. Part of my spiritual journey is learning how to ask for what I need. Establishing healthy relationships with boundaries. Learning to say no to negativity and most important letting go of attachments that are not in my best interest. Hope you enjoy the article below and can reflect on what it is that you can do for your own path. Sometimes the motivation to help others may be an extension of a deep desire to heal a wounded part of ourself. Some people seem called to help others, often from very early on in their childhoods, responding to the needs of family members, strangers, or animals with a selflessness that is impressive. Often, these people appear to have very few needs of their own, and the focus of their lives is on rescuing, helping, and healing others. While there are a few people who are truly able to sustain this completely giving lifestyle, the vast majority has needs that lie beneath the surface, unmet and often unseen. In these cases, their motivation to help others may be an extension of a deep desire to heal a wounded part of themselves that is starving for the kind of love and attention they dole out to those around them on a daily basis. For any number of reasons, they are unable to give themselves the love they need and so they give it to others. This does not mean that they are not meant to be helping others, but it does mean that they would do well to turn some of that helping energy with! in. One problem with the rescuer model is that the individual can get stuck in the role, always living in crisis mode at the expense of inner peace and personal growth. Until the person resolves their own inner dramas, they play them out in their relationships with others, drawn to those who need them and often unable to acknowledge their own needs or get them met. In the worst-case scenario, they enable the other person’s dilemma by not knowing when to stop playing the rescuer and allow the person to figure it out on their own. However, if the rescuer finds the strength to turn within and face the needy aspects of their own psyche, he or she can become a model of empowerment and a true source of healing in the world. Some signs that you or someone you love may need to rescue the rescuer within are inner burnout from over-giving; underlying resentment; an inability to admit to having needs of one’s own; and an unwillingness to be vulnerable. Help comes when we allow ourselves to admit we need it, acknowledging our humanity and our wholeness by acknowledging our pain. The understanding we gain in the process will naturally inform and inspire our ability to help those in need to do the same. Last night I had a dream and the message I received was patience. I think my spirit guides are trying to reassure me that everything will be alright. Being a control freak, letting things be is a new thing for me. I’ve always struggled with patience. However, I am determined to let the Universe guide me and direct me towards whatever path I need to follow. The messages are there, I just have to learn to hear, to see, to pick up, and to move ahead. Sometimes I have to remain still and silent, another area where I’m working on in my spiritual growth. One positive for me is that I can channel my deep woman wisdom if I allow myself to tune everything else out. I hope all beautiful souls are listening to their inner guidance, to follow the path that enables them to fulfill their destiny. This morning I had an opportunity to meditate for a little while longer than I usually do each day. During the meditation, I received a message, I didn’t write it down afterwards and now I’ve forgotten a part of the message. But I do remember the part about looking within and asking the question, Am I happy? Am I fulfilling my purpose? Am I on the right path? I get these reminders from time to time, so it’s good to check in with yourself and take a pulse of how you are feeling. Inner peace didn’t happen quickly, it has been a very slow journey- I’m finally at the other side! I have no regrets, only wounds translated into wisdom. I hope others can reflect and see how your life journey is teaching you the lessons you need to experience growth.